The 70” Service Counter Ready to Assemble with Antique White finish is a multifunctional counter that adds a sleek contemporary look to any retail business. Our ready to assemble case features a modern design and clean lines that will make your merchandise stand out above the rest. 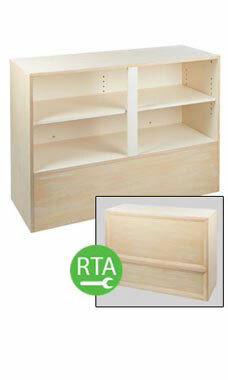 The service counter includes an adjustable rear storage shelf that can be used to house supplies or bags. Our 34" high counter top surface complies with ADA guidelines. Overall Dimension of this unit is 70"W x 18"D x 34"H.